The movement of higher plants are chiefly in the form of bending, twisting, and elongation of certain plant parts or organs. Spontaneous movement: There are other plant movements which take place spontaneously, without any external stimuli. These movements are described spontaneous or autonomic movements. Induced movement: Some plant movements are caused in response to certain to certain stimuli and they are said to be induced or plant movement which take place spontaneously, without any irritability and sensitivity of protoplasm. Movements of the whole plant body or of an organ or of material within the plant cell which occur in responses to inherent factors and are free and spontaneous are said to be movements of locomotion. Examples: cyclosis (streaming of protoplasm), oscillatory movements of Oscillatoria, Motility of zoospores. These movements are brought about by unequal growth on different sides of an organ. A) Nutation : The side of the supporting organ that is in contact of the support grows at a slower rate than the opposite side. This brings about a curvature which helps the supporting organ in spiralling or twinning around the support. B) Nastic : These movements occur due to differences in the rate of growth on the two opposite surfaces of a plant organ. When the movement occurs due to faster growth on the upper surface of the organ, it is said to be epinastic movement and when on the lower surface of the growing organ, it is known as hyponastic movement. Examples: Opening of floral buds and circinately coiled leaves are good examples of nastic movements. These movements occur due to periodic variations in the turgidity of cells of an organ. 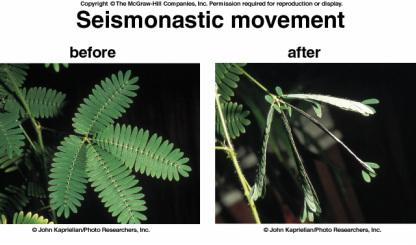 The best example is Indian telegraph plant, Desmodium gyrans, where up and down movements of the two lateral leaflets occur in a rhythmic manner. These leaflets periodically drop down and rise up. This happens due to the presence of large thin walled motor cells at the bases of the leaflets. When these cells lose water into neighboring cells, they collapse and the leaflets drop down, and when they regain water, they become turgid and leaflets acquire their upright position. Growth movements, which occur in response to unidirectional external stimuli & result in positioning of the plant part in the direction of the stimulus, are said to be tropic movements. These curvature movements occur when a plant is provided with artificial or natural light only from one direction. Stems which generally show a curvature toeard the source of light are said to be positively phototropic. Roots which grow away from the source of light are called negatively phototropic. Growth movements induced by stimulus of gravity are said to be geotropism. Primary roots always grow downward in the direction of gravity and thus are positively geotropic, whereas the main shoots grow upward away from the gravity and are thus negatively geotropic. The secondary lateral roots and shoots show a weaker response to gravity and thus take up a position at an angle to the gravitational stimulus and are called diageotropic. Geotropism can be demonstrated in the laboratory with the instrument known as Klinostat. It can allow a potted plant fixed on it to rotate at a definite speed. Two klinostats are taken and a potted plant on each is fixed on a horizontal position. One klinostat is rotated and the other is kept stationary. Observations made after sometime will show that the shoot of the plant fixed on the stationary klinostat bends upwards showing negative geotropism and the root bends downwards showing positive geotropism. But there is no bending in the root and shoot of the plant fixed on the rotating klinostat. This is due to the fact that gravitational stimulus is not unilateral as it affects the sides of the rotating organs equally. Growth movements in response to unilateral stimulus of water are known as hydrotropism. Roots are positively hydrotropic as they bend towards the source of water. This is the movement caused by unilateral stimulus of some chemicals. Movement of pollen tube through the style towards the ovary is an example of chemotropism. Tactic movements are movements of locomotion, which are induced by some unidirectional external stimuli. Their direction is controlled by the direction of the stimulus. These tactic movements are in response to unidirectional light. Examples: Free swimming algae, zoospores, gametes when swim towards the diffused light are said to be positively phototactic and when they move away from the strong light, they are called negatively phototactic. The unidirectional movements of locomotion in response to certain chemicals is called chemotactic. 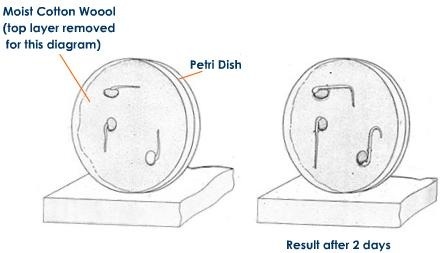 The movement of antherozoids of bryophytes and pteridophytes towards egg due to chemicals. The movement of locomotion in response to certain unidirectional temperature stimulus. Examples: Rapid rotational cytoplasmic movement in the leaf of Vallisneria due to increase in temperature and movement of algae form a cloder to a warmer place. These movement of plant organs occur in response to day and light and thus are also known as sleep movement. Photonastic: If these movement when induced by change in light intensity. Examples: Flowers of Oxalis, Portulaca, Nicotiana, Oenothera etc. The legume Acacia totuosa in the day......and at night; with leaflets exhibiting nyctinastic closure (‘sleep movement’). Thermonastic : If these movement when induced by change in temperature intensity. A temperature rise of only 0.36 degrees is enough to begin to open a crocus. These movement occur in response to some chemical stimulus. Eg. Strong chemonasty is exhibited by long peripheral tentacles of sundew leaves (Drosera) which respond to the presence of organic nitrogenous compounds by bending towards the middle of leaf. These movements are in response to shock by a touch stimulus. BQ: Give a brief account of turgor movement shown by Mimosa pudica. The base of the petiole is swollen (Pulvinus) and similar but smaller pulvinus are present at the baseof each leaflet. Lower half thin walled and upper half thick walled. If the terminal pinnule is struck a blow or touched, the stimulus is conducted to its base and then other pinnules. This stimulus causes fall in turgor of lower cells due to loss of water. Turgid half presses flaccid lower half lower half/ leaf droops. When the touch stimulus is removed regains turgidity.